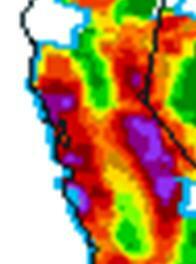 The area was chosen to investigate was based on trying to identify the rainfall events that would, if they occurred today, have the biggest impact on the high population areas around San Francisco and Sacramento.� The area also was chosen because it includes the area being studied during the Hydrometeorological Test Bed West field experiment. where X is the value of the variable (e.g., 500-hPa height, u- and v-component of the 850-hPa wind, or moisture flux, etc), m is the daily mean value (based on 21 day running mean) for that grid point, and s is the standard deviation (based on the 21-day running mean) for each grid point. Normalized anomaly fields of 850-hPa MF and PW are attractive fields to use when trying to anticipate extreme precipitation events where terrain plays a significant role in providing lift.�� Ralph et al. studied 7 floods on the Russian River of California and documented that all were associated with atmospheric rivers which contained anomalously high PW and MF.� The importance of the pineapple express or atmospheric rivers to the moisture transport associated with heavy orographic rainfall events along the west coast has been documented in a number of studies (Lackmann and Gyakum 1999, Ralph et al 2005, Neiman et al. 2007, Junker et al. 2007). 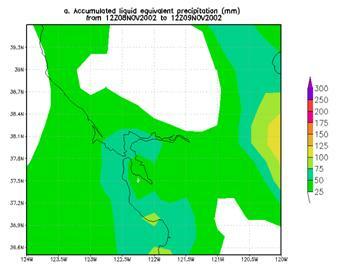 A discussion of the pattern associated with northern California heavy rainfall events is offered here.� Scroll down on the page until you get to the section entitled � Using climatological anomalies as a forecast tool along the west coast.� An example of how you might use normalized anomalies as a forecast tool is also offered in the same training module. The Neiman et al. and Junker et al. 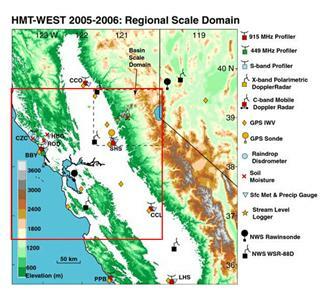 studies found that the strength of the moisture plume that impinges on the coastal or Sierra Nevada ranges of northern California modulates the maximum amount of precipitation that is observed.�� The Junker et al. 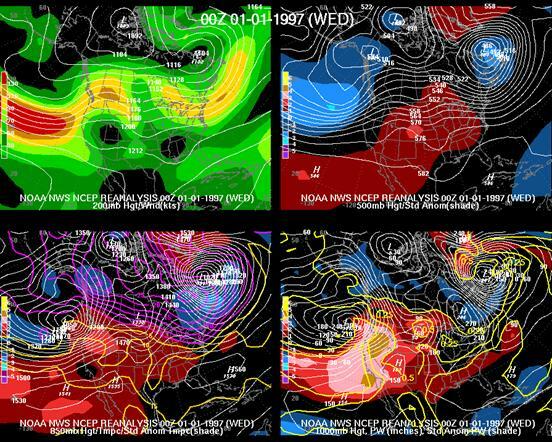 study also noted the similarities in the patterns of 500-hPa height, 850-hPa moisture flux and precipitable water and their anomaly fields for 3 extreme multi-day rainfall events. Expected return frequency as a function of PW at a point just upstream from the Sierra Nevada mountains.� X-axis is the magnitude of the normalized anomaly, the y-axis is the return frequency in months.� The dotted lines highlight the return frequency of a normalized anomaly with a magnitude of 4 and shows the expected return period of 24 months.